Although I received complimentary products to share this post, all opinions are my own. I recently received the opportunity to work with Green Toys. I first came across this brand in a Citrus Lane subscription box and have loved them ever since. Green Toys Inc. makes classic children’s toys constructed from recycled plastic and other environmentally friendly materials. Which helps reduce fossil fuel use and reduce greenhouse gas emissions, improving the overall health and happiness of the planet. We received the watering can to review, which includes a shovel and trowel. And besides being made of 100% recycled plastic, Green Toys are also proudly made in the USA! My daughter loves going over to my mother-in-law's house and helping her water all of her flowers. My husband and I are thinking of starting an herb garden and we did buy a few potted flowers to decorate our front porch, so my daughter has had ample opportunity to get outside and getting to help mommy and daddy in the yard. She has been loving this watering can set and it is so well made that it will be able to be passed down to her little brother as well. They make tons of very cute toys. We already have the Sandwich Shop that my daughter loves putting together and taking a part. We also have some Stacking Cups we received in our Austin Lloyd subscription box which my children make epic towers with. And I have my eye on their tool set (which also comes in pink) for my son this Christmas. 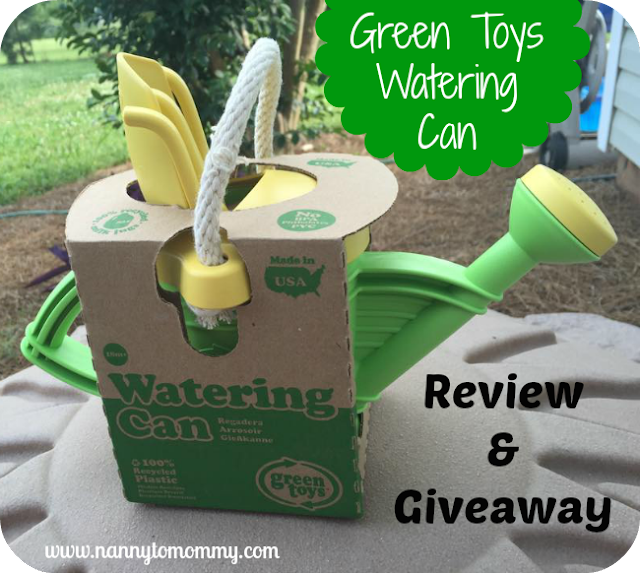 One lucky Nanny to Mommy reader will win a Green Toys Watering Can so they can Come Out & Play! Entry is simple, just follow the prompts on the Rafflecopter below! Open to US only, must be 18+ to enter! Welcome to “Come Out & Play” Giveaway Hop! This event runs June 1st through June 15, 2015! Each participating blogger has a family friendly prize of $15 value or more! So make sure to enter for your chance to win some great prizes! Although I received complimentary products, all opinions are my own. Nanny to Mommy and the Come Out & Play participating bloggers are not responsible for prize fulfillment. I'd like to win this for my niece. I also like the Dump Truck - Pink. Thanks. My daughter loves the boats, especially the tug boat. I like the submarine toy. This would be for my daughter. I like the pink dump truck and the orange tractor. I like the Green Toys Train! My 3 kiddos would love this! The orange tractor is super cute. I'm looking forward to taking grandkids to local festivals, parks, and farmers market. I'd like to get several of the green toys, especially the rocket, sport boats, stacking cups, and the stacker. I'm looking forward to win this interesting and awesome product for my son. I like the Salad Set-very cute. Looking forward to pool time with my grandsons! Im looking foward to spending as much time outside as we can!! I love almost all the Green toys!! They are so much fun!! This toy would go to my son, he loves watering my plants!! We are looking forward to swimming the most! I've been wanting to get my daughter the tea set. We grow our own veggies and I think this would be the perfect way to get her involved in gardening! I am looking forward to planting some flowers. I am looking forward to the warmer weather. I also love their animals on wheels, super cute! I would give this to my daughter. My daughter would love the Build a Bouquet Set! I would keep the watering can for my son, he would also love that Train Set! I also love the Green Toys Recycling Truck. If I won this giveaway, my daughters would have to share. :) They love helping outside watering plants and working in the flower beds, so I know they would love this! We also like the Dig and Discover set! If I win the Watering can it will be for my granddaughter Lily! i also love the mixer truck. i would give the watering can to my kids...we hope to do lots of gardening this summer! I love all these toys! I would like the mixer truck for my grandson. I would give the watering can to my granddaughter. Her and her Papa have a garden this year. My plans for the summer are to visit as much as I can with my grandchildren. I look forward to my sister and niece visiting for my son's birthday! I would give this to my son so he can play when at the lake and help water plants with nana. I am looking forward to all the flowers! I would give this to my granddaughter. I would also love the submarine. Smores! Even though I don't really eat them often, they're just so delicious. But my son would love this, so that way he can help his grandparents water their plants alongside them. Green Toys has a lot of selections but anything that 'flys' and making your own food my son would be enthralled. I love the Build-A-Bouquet, that's adorable!! My family is planning on spending time outside, riding the mountain trails on our RzR, enjoying time with friends, etc. I would give this to my 3yr old who loves to help me water flowers . I also like the Green Toys Train. It would be for my two youngest. I like the tractor for my grandson. Thank you for the entry. looking forward to seeing some family.love there train toy. If I were to win this would be for my son. I love the warmer weather and the ability to spend more time outdoors that the summer months bring. my kids love the ferry boat! i bet they'd love the tractor too! I love summer, sunshine, gardening, & the beach! My youngest would love this watering can. I like the submarine too! Looking forward to camping and hikes! Wed live a green toys truck in pink! I look forward to just relaxing with my wife and kids this summer. I also like the Green Toys train for my kids. I would like to win this for my 3 children. We look forward to lots of swimming! We love the dump truck. I would give the watering can to my three young kids.